Modern day computing has seen its share of increases over the past decade. Each year components in the personal computer have become quicker by a substantial rate and it turns out Gordon Moore was almost correct in his thoughts regarding where the pace of continued development in the semiconductor industry was heading. I guess it was only logical for one to assume that components were meant to become faster in due time, however no one really realized the rate at which this explosion would happen. Take for instance double data rate synchronous dynamic random access memory or DDR SDRAM, the most commonly utilized choice of memory for modern day computers. It was only back in 2000 that we began to see how DDR SDRAM began to be the game changer over standard SDRAM and made all others before it obsolete. DDR memory began to look like a viable solution for the years to come. Fast forward ten years and today we are indeed seeing how DDR has evolved and are now in the DDR3 era. DDR1 is now obsolete while DDR3 is kingpin, however, where does that leave DDR2? If you can believe it or not, DDR2 is still very much a viable option in today’s market and it’s amazing in a way considering it began showing up in computers around 2004. I think the biggest factor that has allowed DDR2 to remain in today’s market is the cost factor compared to DDR3. The fastest DDR2 memory that tops out at 1066MHz is still by far inexpensive than the fastest DDR3 option available today. Another problem that has prevented people from jumping from DDR2 to the entry level DDR3 offerings is that there is not a substantial performance increase to justify the reason to even consider switching at this point in time. Retailers are still selling DDR2 enabled computer systems; motherboard manufactures still produce solutions that take DDR2 as well. For most people in today’s computer purchasing market, they will never realize or feel the difference between the two different memory modules. I’d argue that with the introduction of the Solid State Drive, that this component alone will offer you true substantial and practical improvement to your computer experience than any other component out there on the market today. No CPU, no RAM upgrade will ever equate to more noticeable and attainable results than an SSD provides. The only piece to the computer puzzle that has been bottlenecked for quite a long time was the hard drive and now SSD’s have given new life to the hard drive as we know it today. But for us few who want to eek out the most performance in our systems and earn that 5-10% extra performance, we’ll take it anyway we can get. So for those of you today who have older computer systems that are around 2-4 years old and are deciding to replace your computers, I consider two upgrades that will help bring new life to your systems; more RAM and an SSD. Today I will review and share with you regarding a Dual Channel memory kit upgrade from Wintec Industries that will help you extract as much performance from your DDR 2 system configuration as possible. I present to you the Wintec Industries 4GB AMPX DDR2 1066Mhz Extreme Dual Channel Memory Kit (3AXT8500C5-4096K) review. This is a super long-term review with my thoughts on running this memory kit for close to one year now. This data sheet describes Wintec’s 2x2GB DDR2-1066 SDRAM (Synchronous DRAM) DIMMs as a kit. It contains sixteen 128Mx8-bit 800MHz DDR2 60-ball FBGA components. Each module has been tested to run at DDR2 1066MHz at latency timing of 5-5-5-15 at 2.2V. The SPD is programmed to JEDEC standard DDR2 800MHz and latency timing of 5-5-5-15 at 1.8V. It uses gold plated contact fingers and requires power supply of 1.8V. *Editors Note: I’ve read that some people have had problems setting up this RAM to work properly with their systems. 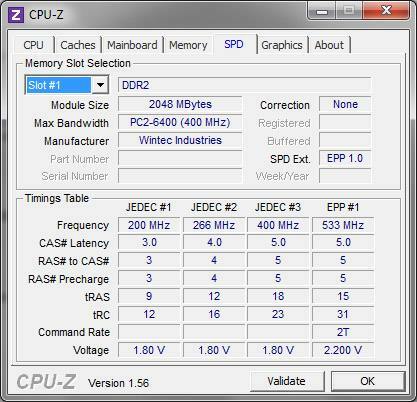 I just wanted to point out first that this is technically DDR2-800 RAM that has been tested to work at the 1066MHz frequency and given an EPP (Enhanced Performance Profile) when you look at the SPD; however, it must be done within the specified timings given and the specified voltage range given by in this case Wintec Industries. You must manually set all these variables in order for the computer to see and recognize this memory kit as DDR2-1066. Failure to do so will result in a reading of DDR2-800, which technically is what these memory sticks originally are. They are just specially picked and matched copies of memory modules that have the capability of operating at the DDR2-1066 frequency. Additionally, only certain motherboards with certain chipsets have the ability of achieving 1066MHz with the specified timings from Wintec Industries. If you have no idea of what I’m talking about, then this probably doesn’t matter to you and that you'll never even consider purchasing this dual channel memory kit. Later on the review, I will show you the SPD timings of this memory kit through the CPUID program and you’ll learn a little more regarding what differences these memory have in comparison to ordinary RAM. Wintec Industries AMPX series of DDR2 and DDR3 memory modules are meant for high performance, gaming oriented computer enthusiasts who want to extract the most out of their systems. These DDR2-800 memory modules are specially picked to be driven at the highest frequency achievable of DDR2 given by JEDEC; 1066MHz. The AMPX by Wintec Industries is given an aggressive looking product packaging where black, red and yellow colors form and suggest an aggressive dual channel memory kit. The first thing you notice on the bright yellow sticker is the proposed lifetime warranty from Wintec Industries. The second thing you realize is that these are not your typical memory modules because they are covered in beautiful black brushed aluminum heat spreaders whose purpose is to absorb the heat given off from the Fine Ball Grid Array based memory modules through the thermal paste and expel this heat evenly through the aluminum heat spreaders. It’s a principle that does work and will help ensure longevity of the product. The whole AMPX package looks rather inviting. These memory sticks are beautiful to behold. You have the bright green PCB contrasting behind the black brushed aluminum, these two colors in tandem helps the memory sticks pop out visually. Additionally, the two metal clips also provide another contrasting color while the gold pin-outs help to finish the clean and aggressive feel. The AMPX logo is featured on the front of the memory stick while the back is bare, which I feel Wintec Industries should have included the AMPX logo also on the rear. When you look at the front and you flip the memory modules around, it almost looks like you have generic memory. Popping off the two heat spreader clips from the memory modules reveals a lengthy grey strip of thermal paste that is used to transfer heat from the two surfaces and what type of memory is specifically utilized in this dual channel memory kit. This AMPX DDR2-1066 dual channel memory kit reveals Samsung based FBGA memory chips (K4T1G084QQ). I’m going to try something new instead of posting the standard benchmark routine. I’m not sure all my viewers will know what they are looking at, so for those who want to learn, I will put it simply in words to make it easier. When you jump from single-channel memory (when you have one stick of RAM) to dual-channel memory (when you have two sticks of RAM) you will gain extra performance to applications that are memory intensive. For every day simple tasks, it is unlikely that you will notice any substantial differences, except for very slight ones that are happening in the background. The differences you’ll be able to realize to the fullest are in applications that are memory intensive such as games, 3D rendering, calculating and crunching varieties of programs. The basic premise of adding more RAM is to help data being transferred between memory and CPU to be more efficient when the computer is not looking for information in the cache. But how do we get even more efficiency between CPU and RAM now that we’ve added more memory to the system? This requires purchasing RAM, like the Wintec AMPX kit I am reviewing today, that have faster memory timings that say generic memory which are relaxed at best and require no need to be fast. These generic memories are inferior as well and can’t have fast timings because the memory chips used aren’t good enough to be driven at faster speeds. For example in games you may feel the result of the dual-channel memory kit with faster timings by way of faster FPS (frames per second) or in memory crunching programs such as HyperPi (calculating Pi to the millions) you will see the differences down to milliseconds. I experienced going from single-channel 2GB memory going to dual-channel 4GB memory being 9% faster in HyperPi. Above is the Wintec EPP profile. Below is normal memory with no EPP profile. The Wintec Industries 4GB (2x2GB) AMPX DDR2 1066Mhz Extreme Dual Channel Memory Kit that I’ve reviewed today does bring that extra performance to your computer, especially if you had little memory to begin with. I’ve been running it for close to one year now and have experienced zero reliability issues and have confirmed that it can do what it states and hit 1066MHz if done correctly. 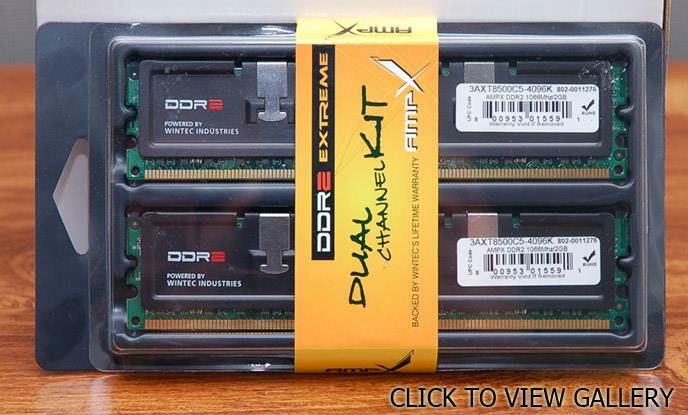 I have no troubles to not recommend the Wintec Industries 4GB (2x2GB) AMPX DDR2 1066Mhz Extreme Dual Channel Memory Kit. I almost wish that Wintec Industries would include a small quick users guide in the package explaining the memory timings on this RAM and how customers can manually select these in their BIOS to be able to run at 1066Mhz, but I’m thinking they don’t want to be responsible for any mistakes that a user might do within a BIOS because it can be complex and damaging if not done correctly. And frankly some motherboard’s BIOS are not able to change any complex settings, so I can understand why they and other memory manufactures don’t look to include an overview and guide with their memory. All in all, if you’re looking to squeeze that extra performance by way of faster timings and want a dual-channel solution, the Wintec Industries AMPX series of DDR2 and DDR3 memory is definitely able to supply you with the percentage differences that we enthusiasts always seek to eek out no matter how dire the performance-to-cost ratio is. But I would suggest for the average Joe going from an SSD first, secondly CPU and thirdly RAM if you want to experience the most substantial improvements that you will be able to feel.